Berlioz also knew what he was doing when he wrote his transfixing Requiem (“Grande Messe des Morts”) in 1837, commissioned by the French government to commemorate the soldiers who died in the July Revolution of 1830. The work had its premiere at the magnificent church of St.-Louis-des-Invalides  in Paris. In composing this 90-minute score for large chorus and orchestra, with four offstage batteries of brasses, Berlioz used the acoustical properties of the church space as an element in the composition. On Tuesday night I heard the Berlioz Requiem in London’s magnificent St. Paul’s Cathedral , with Colin Davis conducting the London Symphony Orchestra , the London Symphony Chorus and the London Philharmonic Choir, played before a sold-out audience of about 2,000. Mr. Davis, an astute conductor of Berlioz, has had a special affinity for this piece and a long, productive relationship with the great London Symphony. He conducted the orchestra in the Berlioz Requiem at St. Paul’s in 1962. So he long ago figured out how to make the piece come to life in this reverberant space. The concert was part of the yearly City of London Festival , celebrating its 50th anniversary this summer. For a visitor from New York, keeping the overlapping festivals in London straight is not easy. Officially, the London 2012 Festival , hooked to the Olympics, is a separate thing. 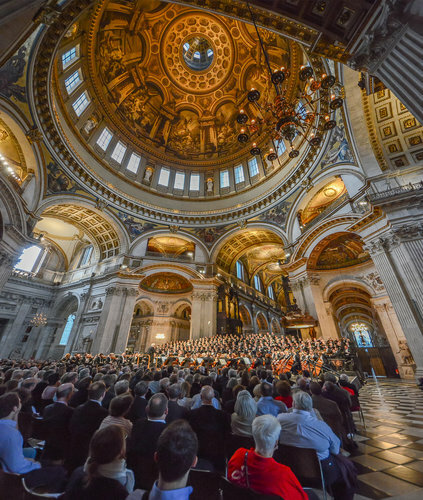 A London Symphony concert at St. Paul’s has been an annual feature of the City of London Festival. Then there are the queen’s diamond jubilee festivities. But back to Berlioz.